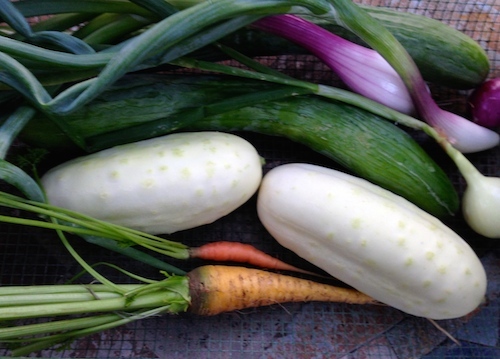 Cukes and onions will be sliced and chilled in a bowl of herb vinegar and water. Pulled a few more onions. They are really starting to size up and I don’t want to crowd them. These little onions (yellow, white, red) are great for thinly slicing and putting in the vinegar and cucumber bowl in the fridge. 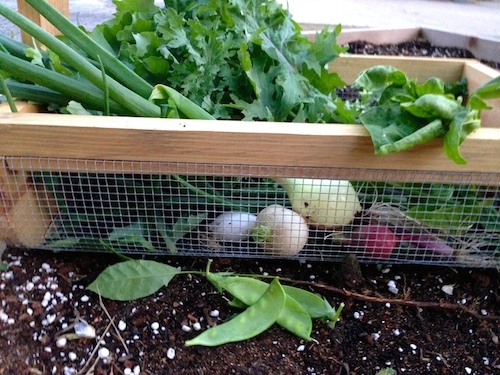 The garden is creeping closer and closer to a vegetable explosion. Almost. Almost ready. Squash, onions, cucumbers, tomatoes almost ripe. ‘better wait another day or two before picking. The garlic is in the garage, curing. Most of it is braided now. It looks like the garlic will be cured before we need the space for onions. 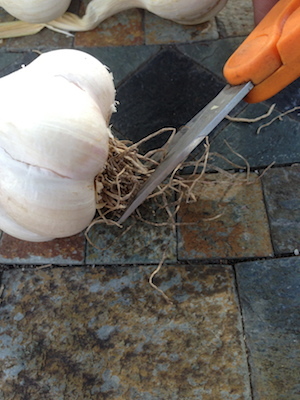 Most of the garlic is plump and beautiful, about 2″ in diameter. I will pickle some and add some to vinegar. But please, please do not store raw garlic in olive oil. It can kill you. When I have a lot of garlic, I use more. Last night we had a pasta side with just EVOO, garlic, basil, parsley. 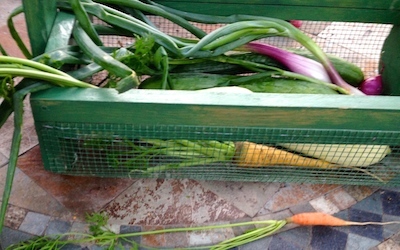 I pulled these carrots to see in they are coloring up and anywhere near picking time. No. They are not. There are several varieties. When I saw the reasonable seed prices at Nichols, I kinda went overboard. This carrots to 2 -3 ” apart for long straight carrots. The best time to grow carrots is in the fall. So you have plenty of time to order seed and give it a try. Strangely, the carrots are not all that tempting for the gang of baby bunnies that were born in my garden and never left. They are crazy about Haricot verts. But that is another story.